Les Trois Vallées makes up the largest ski resort in the world – with 600 kilometers of trails (over 370 miles) served by 200 interconnected lifts among 8 ski areas, a huge playground for family skiing. 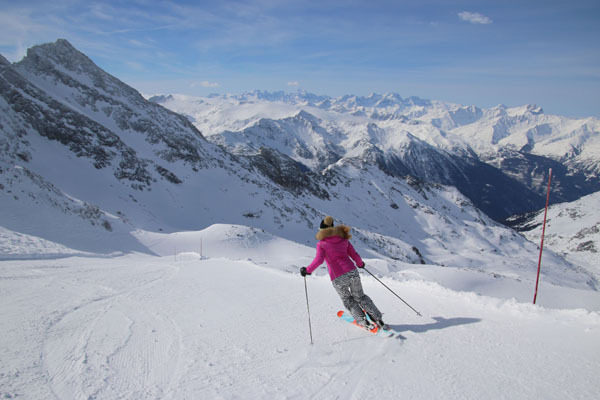 While the name is literally Three Valleys, it’s so much more than that, in fact its 4 valleys, 6 glaciers, 25 peaks, including 8 ski regions, the biggest of which are Courchevel, Méribel and Val Thorens. Courchevel is the best known of Les Trois Vallées ski areas, most famous for its high end clientele, and for its beautiful ski villages with upscale lodging – beautiful boutique hotels bearing 5 stars, gastronomic dining, designer shopping, and also fun activities for families and lively après ski. Courchevel has wonderful family fun ski zones, gorgeous groomed trails skiing, pretty glades and above tree line skiing as well. For lunch and après ski, Courchevel has great on mountain chalets. You can easily access the other ski resorts – Val Thorens and Méribel, from Courchevel by lift. See our review of where to stay in Courchevel. Val Thorens is the biggest of Les Trois Vallees, and the highest Alps skiing at 10,500′. Here you have vast above tree-line skiing, wide open bowls with a few groomed trails off each dramatic peak, plus limitless off-piste opportunities. Val Thorens has a big ski school for kids learning to ski. High capacity ski lifts, trams, gondolas and six packs shoot off in every direction. Val Thoren’s on mountain village is more modern, with bigger hotels and less of the quaint cozy feel – but therefore its more affordable than its sister valleys. Méribel is a more charming Savoyard village, with classic chalet architecture, a main street with shopping, bars and restaurants, and a convivial alpine feel. Families will like Méribel for its Olympic Park with ice skating, bowling and a pool. Méribel is indeed the heart of Les 3 Vallées, you can easily ride one lift and be skiing Courchevel, or a few to be at Val Thorens’ vast terrain. Many consider Méribel to be France’s most well-designed ski resort for its pretty village, ski in ski out proximity of most hotels and lodges, and great events and après ski at Rond Point. Trois Vallées’ offers skiers and snowboarders 370 miles of ski terrain, more than you can explore in a ski week, or a ski season. its definitely among our Top French Family Ski Resorts. The closest airport to fly into is Geneva to reach Les Trois Vallées – by car, train or bus. The mountain range is east of Grenoble, west of Val D’Isère – Tignes and south of Chamonix Mont Blanc.